After fans had expressed their anger at the use of Adele’s hits as warm-up music by Presidential hopeful, Donald Trump, the singer told him that he didn’t have permission to use her music at campaign rallies. The Republican frontrunner had stoked up the atmosphere at various campaign events by consistently playing ‘Rolling in the Deep’, Adele’s smash hit, before his appearance. Trump is a huge fan of Adele’s and he even attended her concert last year in New York. He used another of the singer’s songs, Skyfall, which was primarily the James Bond theme, when he delivered his apocalyptic stump speech about the future of America. Adele’s fans were none too pleased with the appropriation of her music by Trump for his campaign. Some had predicted that Trump had most likely not gotten an endorsement for doing so and she would object. Others had been downright furious as they called the Presidential candidate a bigot. Some had also asked if the singer was being paid for the use of her music. Adele finally chose to break her silence regarding this controversy as one spokesman of the singer clearly stated that she is not associated with Trump in any way and neither did she endorse the use of her music for his campaign. The spokesman said that Adele hadn’t permitted the use of her music for political campaigns at all. Mike Huckabee, a rival of Trump’s for the Republican nomination, has also attempted to use the popularity of Adele’s music. Trailing the field, Huckabee posted a cover of her latest hit ‘Hello’ on YouTube and Twitter in which the lyrics deal with the Iowa caucus and competitors. The post’s audio has been shut off because of a claim from the song’s copyright holder. 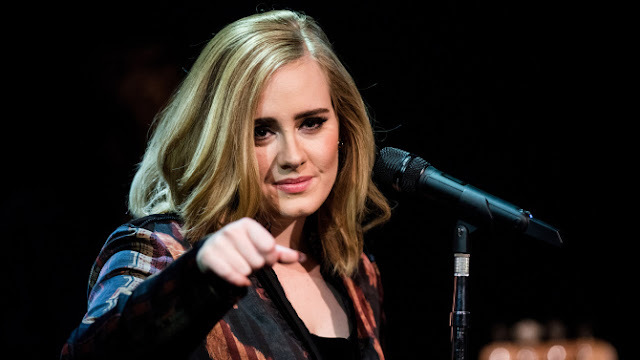 Since she made a statement in 2011 that she was a ‘Labour girl’, Adele has chosen to stay out of the political circle. Steven Tyler, the frontman for Aerosmith, has also told Donald Trump to stop using Dream On, the power ballad, at campaign events. A second cease-and-desist letter was sent to the campaign committee of Trump by Tyler’s attorneys, which stated that the Republican’s candidate didn’t have Tyler’s permission for using their songs as it gave the false impression that he had endorsed the campaign or was somehow connected to it. Adele hasn’t taken this step as yet. Some fans also said that her songs weren’t exactly appropriate for the political campaigning. Previously, Adele’s fans had been annoyed by Trump last November at the Radio City Music Hall, when he chose to ‘cut the line’ in order to reach his seat. Musicians have regularly complained about the use of their music by politicians. Ted Cruz, the Texas senator and also another hopeful candidate for 2016, along with Trump, had also made use of It’s the End of the World as We Know It (And I Feel Fine) and Michael Stipe, the REM frontman had objected to the use of their band’s 1984 music. In 1984, Bruce Springsteen had also objected to the use of his song Born in the USA by Ronald Reagan. Meanwhile, Vampire Weekend, the indie band, has chosen to publicly endorse Bernie Sanders, a Democrat hopeful for the 2016 race. At an Iowa students rally, the group had taken up the stage with the Vermont Senator as they performed a cover of This Land is your Land by Woody Guthrie.